Epic Death is a race to the grave. It’s a fantastic because the game literally turns a complete 180°. The first half of the game has your party adventuring on quests from mildly perilous chickens, slightly dangerous hangovers to lethal evil wizards. Each quest is represented by a difficulty level and required number of successes, rolling a pool of dice in an attempt to meet the requirements. Sorry did I say pool, this is a whole damn lake of dice. You start with 10 but this can ramp by using fate cards, special effect cards that can be played on yourself or other players; you’ll be rolling 15 dice in no time. This is a job in itself. I’m a fairly large chap and I struggled to hold all 15 dice in my hands and roll them, it’s not a game of Epic Death unless at least one dice ends up on the floor (which I reckon should actually have a special rule attached, like any dice off the table are automatically a fail). If your band of plucky adventurers win then loot and more fate cards are their reward, fail and they face the eternal embarrassment of not being able to rescue a cat in a tree and gain negative points, or Fail as the game calls them. Don’t worry because Fail doesn’t score unless the character dies but those fate cards can kill characters, oh dear, your character has died a loser. So your party quests and suits up (although it should be noted that equipment doesn’t add benefits only points) until you run out of boring mundane quests and switch to the epic quests. Now the aim is to die and you’ll be using all those bonus cards to make each quest more difficult. The first player to lose their entire party ends the game and it’s time to score some epicness. Epic Death is a surprising amount of fun. It’s all about using your fate cards to totally screw up your opponent, and the real fun comes when the game flips and you start to realise that the card you’ve been holding on to as an advantage immediately become a crippling disadvantage for the enemy. My favourite use is holding on to a resurrection card and then bringing your opponent’s heroes back from the dead, right when they want to be dying. 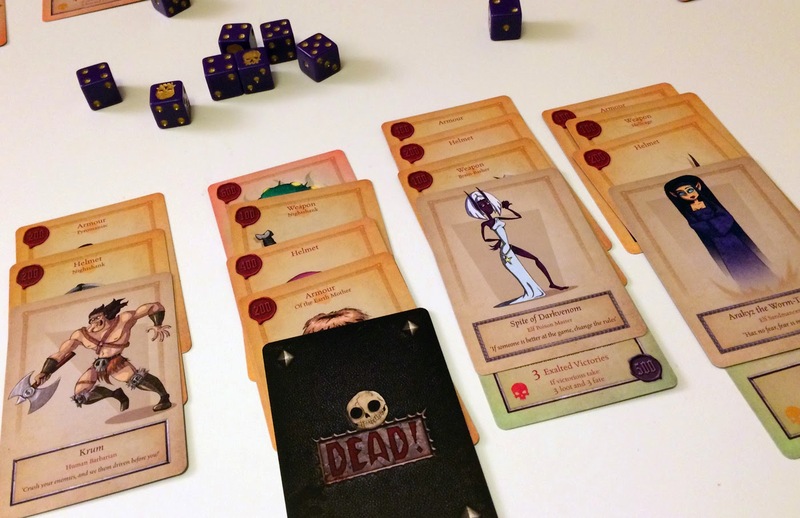 Epic Death shares a lot of DNA with Munchkin, and I’m happy to say it’s a much better game. 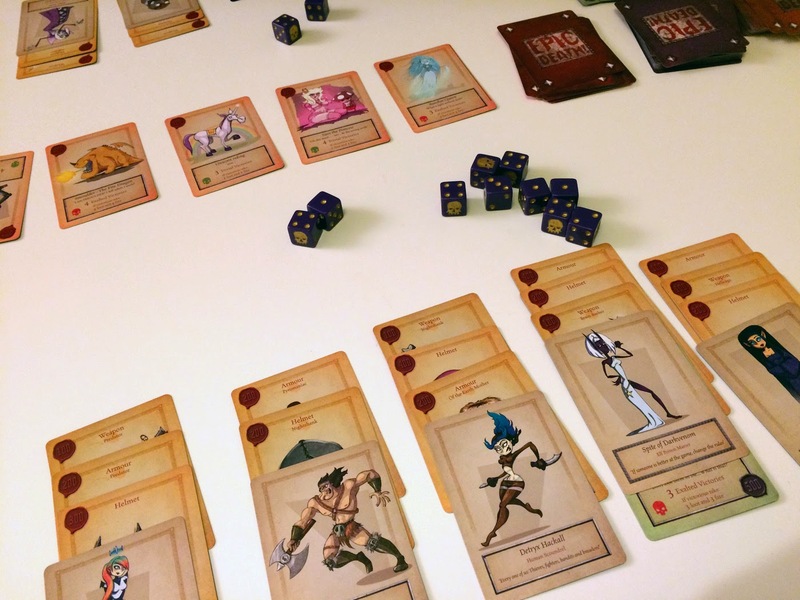 It’s got genuinely funny cards, poking fun at of both your typical D&D and video games. It’s got a lot of ‘take that’ action where you royally screw your opponent right when they think they’re about to win. But the game has a time limit, solving Munchkin’s biggest problem. 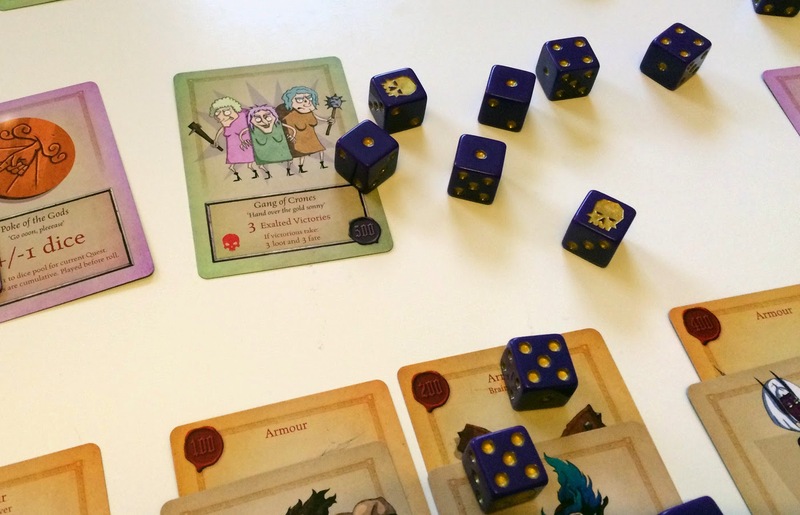 If you’re thinking that Munchkin is your game I’m going to be bold, don’t buy Munchkin, go buy Epic Death instead. However, if Munchkin is your idea of gaming hell, then I suggest staying away from Epic Death, although a better game the improvements it offers isn’t going to be enough to bring you round. If I have a reservation it’s that I am worried about the game’s longevity, play this game every week for a month and you’re going to be burnt out on it. You will see every card in each game, so you’re not going to find any surprises even on your second run through. It’s a game that needs to be carefully rationed. Epic Death is an incredibly random game but there’s a certain primal joy in throwing a bucket of dice across a table and hoping that you get at least three sixes (or in the case of the final rounds praying for nothing but ones). It’s an excuse to play craps but instead of throwing two dice, throwing ALL of the dice. It isn’t a particularly deep game, actually it’s a fun but shallow game that wears that shallowness with pride. Epic Death is a game best enjoyed over drinks with a few like minded friends who want 30 minutes of silly fun and aren’t going to be offended that your game isn’t about shipping tiny wooden cubes. "But the game has a time limit, solving Munchkin’s biggest problem." Do you mean the fact that the first party death triggers the end? How is this different from a particular level triggering the end of Munchkin? I haven't played this, so this is not a rhetorical question. I'm genuinely curious. In Munchkin when a player hits level 9 the emphasis changes from attempting to win to trying to prevent the leader from winning. It puts the game into a holding pattern and can make the game last a long time, there are horror tales of Munchkin games lasting 3 hours. 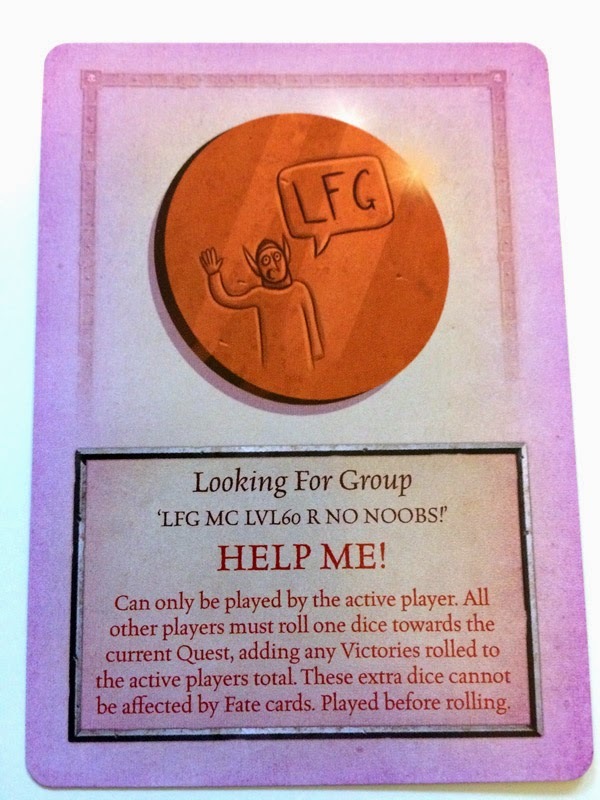 In Epic Death you play until one entire party is dead or the quest deck runs out. Attempting to kill off your party can result in a similar holding pattern but due to the limited quest deck there's still a definite end point.